Why See A Physical Therapist? Medical Therapeutic Yoga utilizes a holistic, biopsychosocial model of care, prescribing yoga in a safe and effective manner. It combines the expertise of a physical therapist with the traditional components of yoga, making it safe for all ages and medical diagnoses. Through dedicated, one-on-one hour-long appointments, we will work together to identify obstacles to healing through altering lifestyle choices and taking control of your health and well-being. How does Medical Therapeutic Yoga Differ From Other Types of Yoga? Medical Therapeutic Yoga classes are taught by a Professional Yoga Therapy Institute®-trained physical therapist who takes into account your specific condition and can adjust and adapt your program on the fly. We begin by focusing on breath work and yoga pre-postures, providing a safe platform to build upon. Together we’ll tailor a plan to your specific needs that provides instruction and education on best movement patterns based on your medical history. No previous experience with yoga is required! Want to check it out for yourself or keep in touch? Follow us on Instagram! Rachel graduated with her Bachelor of Science degree in Exercise Science from University of North Carolina Wilmington and her Doctor of Physical Therapy (DPT) degree from Western Carolina University. She completed the Orthopedic Residency program with Evidence In Motion and became a board certified Orthopedic Clinical Specialist in 2017. Rachel started the Exhale Physical Therapy & Medical Therapeutic Yoga program in 2018. 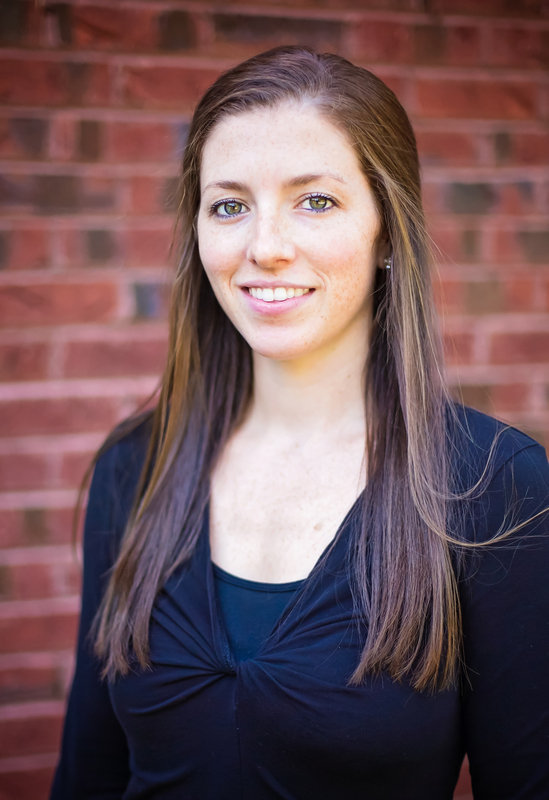 In addition to individual appointments, she facilitates group yoga classes in the Cary clinic. Rachel lives with her husband, two daughters, and two dogs in Pittsboro, NC. She enjoys being active, traveling, and returning to the beach and mountains often. Most health plans have benefits for the physical therapy portion of your treatment, less any required co-pays/co-insurance/deductibles. The integrated model of Medical Therapeutic Yoga incorporates a studio session with your physical therapy components, so there is a separate small yoga studio fee which is not a covered health plan benefit or an approved expense with HSA or FSA plans. Call 919-388-0111 today to schedule your one-on-one physical therapy appointment! Group classes will take place in our private yoga studio, located inside the Cary BreakThrough Physical Therapy clinic. Classes will cost $25. Small class sizes (max 8-people) ensure you quality instruction and hands-on facilitation. Participants are asked to fill out a short medical screen prior to their first class and must be able to get up and down from the floor independently. Exhale yoga classes are beneficial for a wide range of medical diagnoses, all ages, and all experience levels. No prior yoga experience is necessary. Click here to view the class schedule and reserve your spot!